In response to some distress signals, Kirk, Spock, and McCoy beam down to the surface of an unknown planet. They’ve beamed right into a hall of some kind, adorned with Greek columns and statues. Contrary to the sensor readings, the building seems to indeed be inhabited–by some horrible monster! An intimidating shadow greets them, but ominous music cues aside it’s really just a lighting trick and it turns out to be Alexander, a chipper and talkative dwarf. 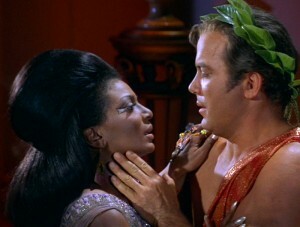 KIRK: Who are the inhabitants of this planet? ALEXANDER: Oh, Platonians. I’m sure you’ve never heard of us. Our native star is Sahndara. Millennia ago, just before it went nova, we managed to escape. Our leader liked Plato’s ideas Plato, Platonius. See? In fact, our present philosopher-king, Parmen, sometimes calls us Plato’s children, although we sometimes think of ourselves more as Plato’s stepchildren. Now that the premise, background, and title are explained, you don’t even need to see the episode! No really. Don’t. Please don’t.